Please find a list of host universities here. We have included the English Name of each University to offer an overview over the participating universities and help find contact information. We are happy to evaluate your academic achievements for your "reference letter by the head of the recommending institution". Please reach out to us with your request. In case you need more information, please get in touch with Prof. Dr. LIU Liang by Email, liang.liu@uni-due.de. Please find an overview over the different universities here: http://cis.chinese.cn/Account/AcceptShool. We are happy to provide you with an English translation to offer an overview over the participating universities and help find contact information. Please find our spreadsheet here. 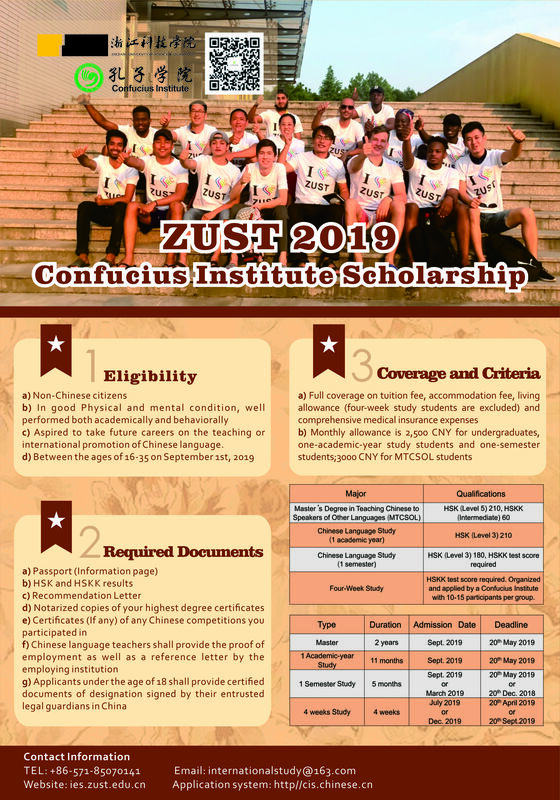 Please find the Confucius Institute Scholarship Application Guide of Shanghai University 2019 here on Weixin / Wechat. Each year, the governing body of the Confucius Institutes organizes Summer Camps in China for students. Students from middle school onwards are eligble to apply. The trip generally takes two weeks, the participants are taken to different places in China, organised under a particular theme. The prerequisite for a successful application are basic knowledge of Chinese. Each year, the Chinese National Office for Teaching Chinese as a Foreign Language (Hanban) in Beijing offers training for Chinese language teachers. The tuition fee, costs for teaching materials and accommodation in China are usually provided by Hanban. PhD students and young researchers in the field of humane discipline and social sciences can get funding from the Confucius Institute under certain conditions of the “China Studies Program”. Excellent Chinese skills are required for application. The China Studies Program basically offers six different funding opportunities for graduate students and young researchers. For your online application please visit: http://ccsp.chinese.cn/node_43263.htm. Please find more information here: http://ccsp.chinese.cn, or contact the Division of Sinology and China Studies. You are also welcome to pay attentions to other CCSP programs (please contact ccsp@hanban.org). Don't hesitate to contact the secretary's office at our Confucius Institute, Ms. Urban, and state the planned proposition. In order to apply for a Confucius Institute Scholarship, please visit the website of Hanban, Council of the Confucius Institute Headquarters in Beijing in the People’s Republic of China. Hanban is responsible for collecting and processing personal data of all applicants. The Confucius Institute Metropolis Ruhr is not involved in data collection and we have no influence on the use of data collected by Hanban. Please note that data protection regulations in the People’s Republic of China are not identical to those applicable in the EU. Please note also that there is no EU Commission decision that confirms that data protection is of an adequate standard in the People’s Republic of China. Please find the Hanban website for your application here.